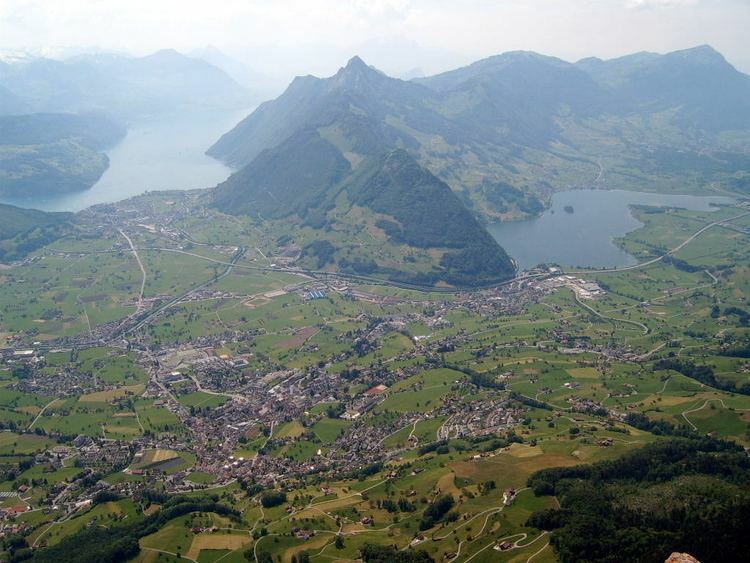 The town of Schwyz ( listen ; French: ; Italian: ) is the capital of the canton of Schwyz in Switzerland. The Federal Charter of 1291 or Bundesbrief, the charter that eventually led to the foundation of Switzerland, can be seen at the Bundesbriefmuseum. The official language of Schwyz is (the Swiss variety of Standard) German, but the main spoken language is the local variant of the Alemannic Swiss German dialect. While a few Roman era coins have been found in Schwyz, the earliest evidence of a settlement comes from the 8th century. The Alamanni cemetery at the parish church and the church itself are both from the first half of the 8th century. This first church was followed by a second ottonian church around 1000, which may have been destroyed by an earthquake in 1117. In 1121 the third church building, a romanesque building, was consecrated. This was followed in the 15th Century by the much larger fourth church which was destroyed, along with much of the village, by fire in 1642. The fifth church, an early baroque church was replaced because of serious structural defects by the current late baroque church which was dedicated in 1774. Because Schwyz was the capital of a canton, many of the government organizations administered both the town and the canton at the same time, and the history of the town is closely tied to the history of the canton. According to the chronicle of Johann Stumpf from 1548, the old town originally consisted of a village square, the church and its cemetery, the town hall, the inn, the archive tower and a number of scattered wooden houses. Around 1500, to distinguish it from the Canton of Schwyz, Schwyz town was often called Kilchgassen, which meant the village around the church but not the surrounding villages. The fire of 1642, which destroyed 47 buildings in the center of the village, allowed the town to be totally rebuilt. A new, larger town square with major roads radiating out was built in front of the new church and the new city hall. The houses were rebuilt as urban townhouses and ring of about 30 large patrician farm houses grew up surrounding the village center. Schwyz has an area, as of 2006, of 53.2 square kilometers (20.5 sq mi). Of this area, 46.4% is used for agricultural purposes, while 39.1% is forested. Of the rest of the land, 8.7% is settled (buildings or roads) and the remainder (5.8%) is non-productive (rivers, glaciers or mountains).